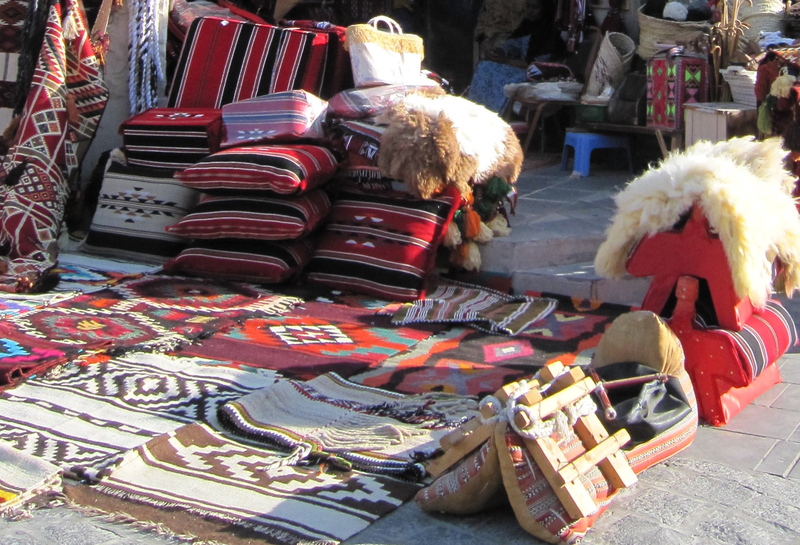 This blog contains the photographs, observations and reflections of Rena Diana, an educator and writer, during extended stays in the Arabian Gulf, China, and Mongolia. 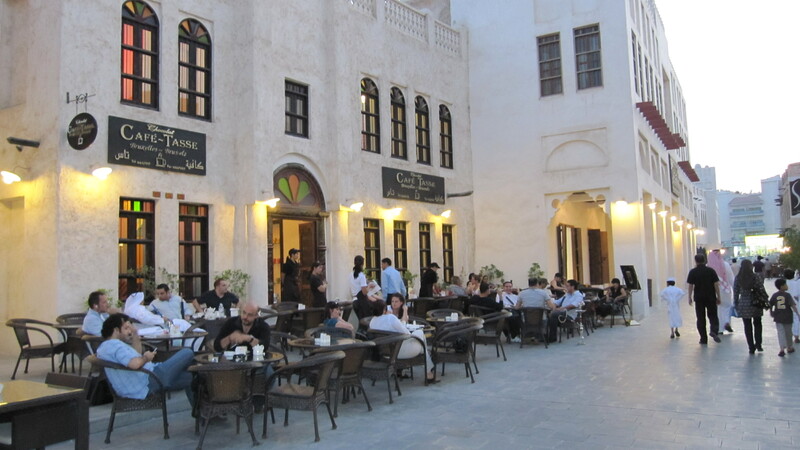 My favorite place in Doha, in addition to the Museum of Islamic Art, is Souq Waqif, which literally means “market standing.” It is located along a dry riverbed, the musheireb, near the corniche along the Arabian Gulf. In olden times, this was the center of town, and the vendors would stand by their temporary market stalls, ready to move them as the river rose and its waters encroached. 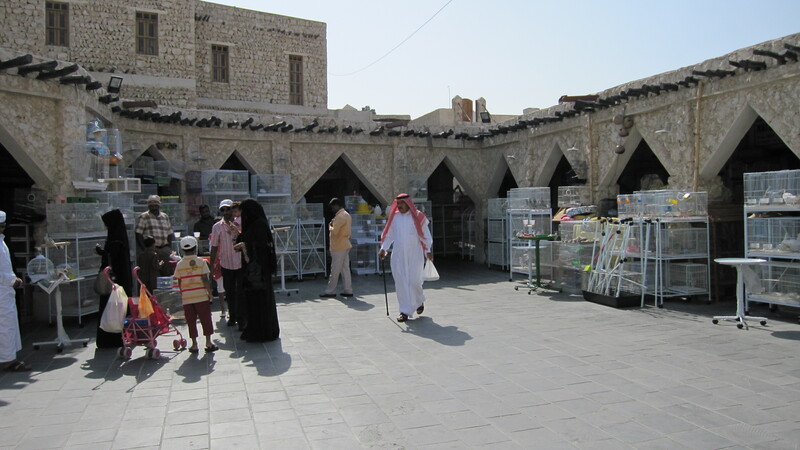 The souq , a maze of narrow alleyways, twisting among simple mud dwellings, captures the flavor of the Arab world. Fragrances of incense, perfumed oils, and spices. Ginger from China, teas from Ceylon, cinnamon from India, medicinal herbs from Iran, cardamom, saffron and Oudh (sandalwood.) 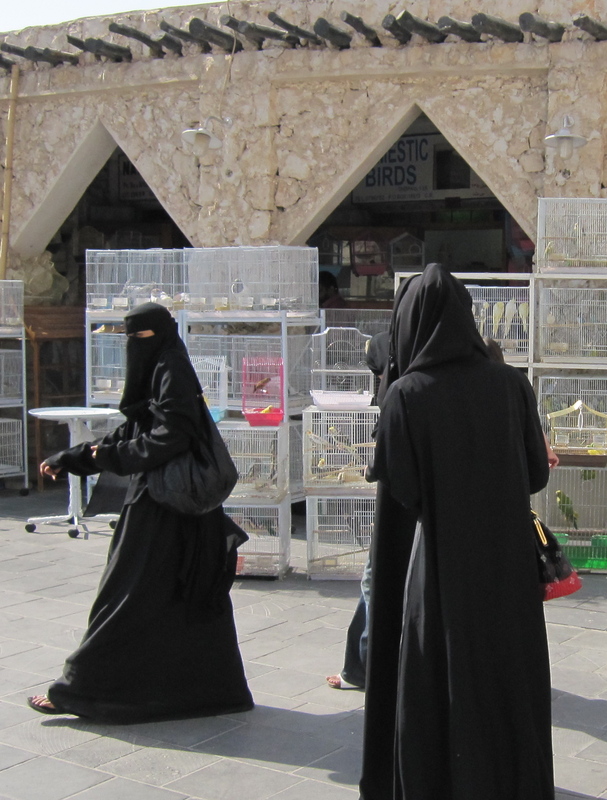 Wooden carts display dyes, kohl, hookah (“hubbly bubbly”) pipes, mubkhari (mud incense burners), pumice stones, brass dalla (coffee pots) and even small pets in cages. 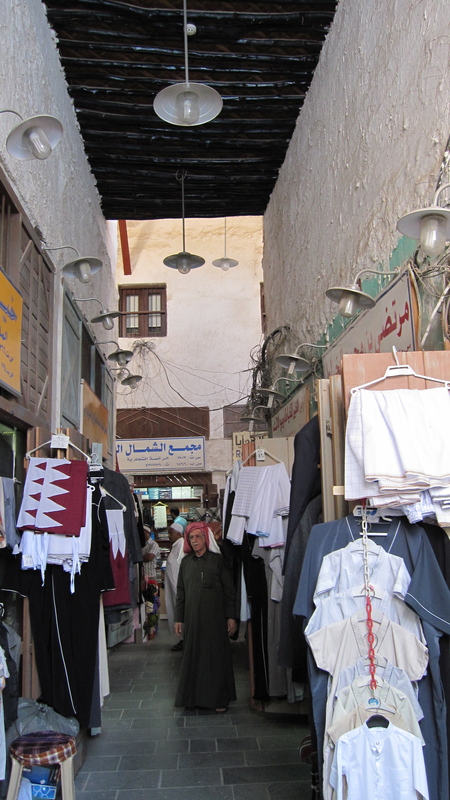 Closet-size shops brim with wares: pashminas, cookware, tools, Aladdin Lamps, tin lanterns, daggers and stacks of Bedouin cushions and camel blankets woven in bright primary colors.In the distance, stately minarets and chedis of mosques, topped with the crescent moon symbol, form striking silhouettes. 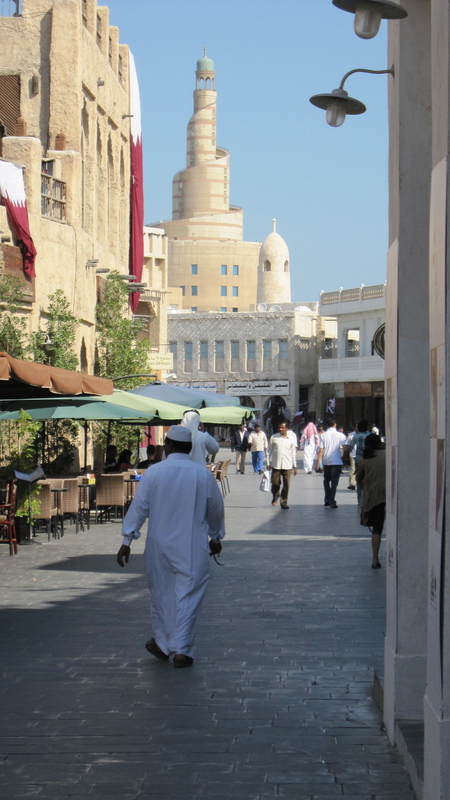 Muslim Qatari families meander about. Lively brown-eyed children climb over and under benches and tables and bolts of cloth. Women are gliding- not walking- in their graceful, flowing abayas. 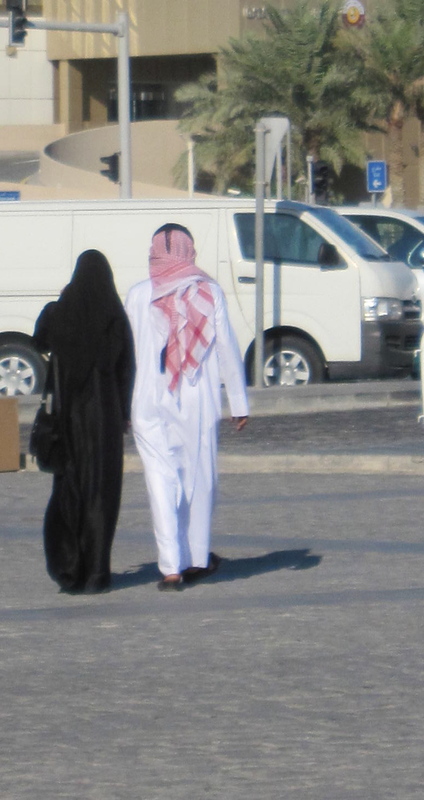 Young Muslim couples stroll along beside each other, their private emotions well concealed by their attire and demeanor. There is something enchanting about how some of the women, their faces entirely covered by a simple black scarf, whisper to their companions. I purchase a few items. Several pashminas. Bronze camel candleholders. 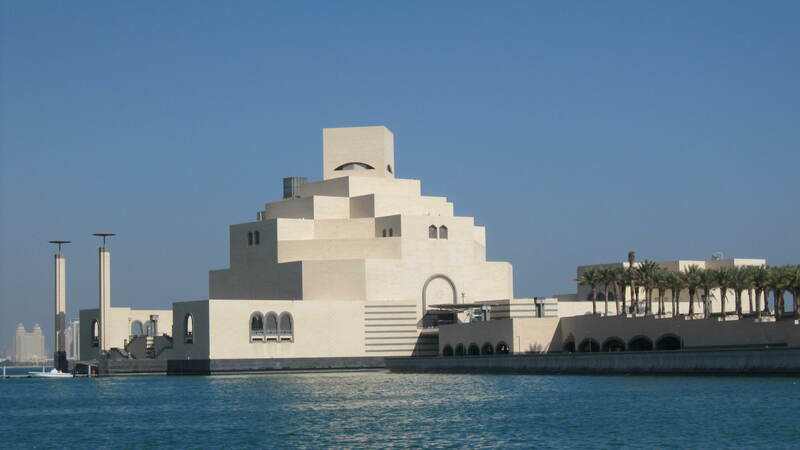 A book of essays written by young Qatari women. It still feels strange to me to bargain down the prices, especially since they are so low by American standards. It is expected, however, so I am refining my approach with the right phrases: “Oh, no, that is much more than I want to spend.” Or “But I saw this at another shop for much less.” Or- and this line works the best-“I do not have that much money with me.” Thus the bantering continues and a mutual price is agreed on. A friendly young man urges me to purchase some of his Omani silver jewelry and silver crown-type headdresses by putting them on me. I appease him by buying a couple pieces. They will always remind me of this day, this place. 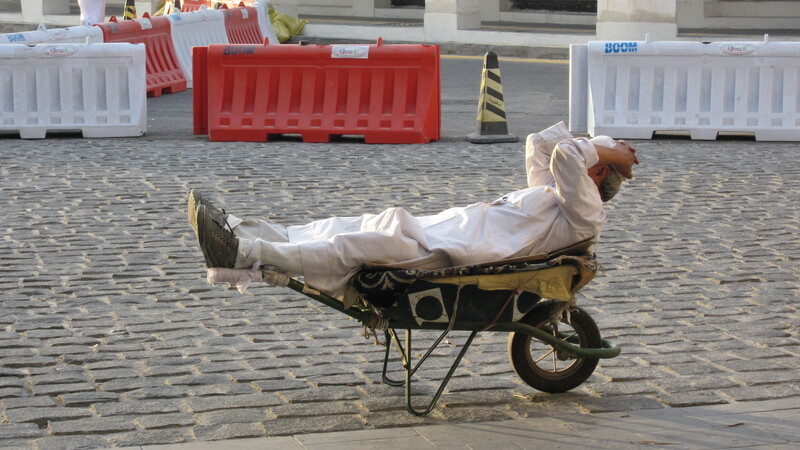 An unfamiliar sight: old men sitting or lying in wheelbarrows, which they use to ferry about shoppers’ purchases. Human camels on wheels. They seem remarkably cheerful. A familiar sight: a young adolescent boy, around twelve, still soft, smooth and pudgy in the cheeks, proudly wearing a thobe and ghutra, but awkward and self-conscious, flipping his head-scarf this way and that to get the right effect, tripping a bit over his gown. A rite of passage. A man-child trying out his new identity. Like a young American boy wearing his first tie. So these seven men and I carry on together. (See May 14 and May 21 Posts: Lessons from My Students Parts 1 and 2) We use the texts and other ESL instructional materials provided, and I improvise with my own worksheets, writing assignments, and reading comprehension exercises, based on their interests and skill levels. In class, we try all kinds of approaches, including the old tried-and-true ones, like reading aloud in a circle; describing our weekends, families, and daily schedules; giving short spontaneous speeches on various topics. My supervisor, Mary, is a technology whiz and, with her help, we watch and analyze TED talks together and complete listening quizzes after watching simple cartoon narratives. They make steady progress. And my own learning curve is sky high. 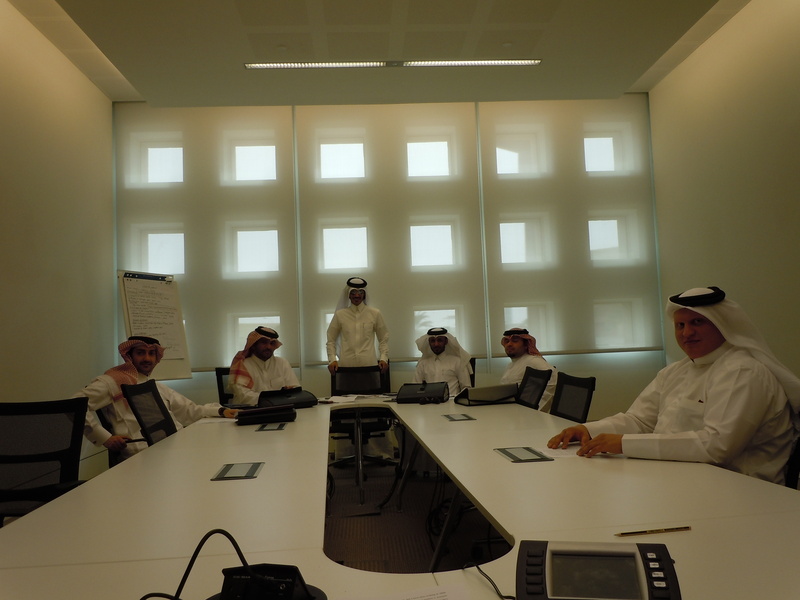 It is the informal exchanges that we have, however, that stimulate us the most. One day Siraj complains about taking timed tests. They make him nervous. He feels that he has to rush and make superficial choices. The scores do not reflect what he has mastered, what he understands. “In my profession,” he remarks, “it is necessary to take my time to make wise judgments. I like to consider all options. Hurrying would be dangerous.” He sees these standard assessments as unfair. Good point, Siraj. As my departure for the United States for the summer draws near, the students want to put the books away and “just talk.” I am curious – about what? Certain topics, such as religion and the royal family are off limits. I welcome this opportunity for dialogue, but I will follow their lead. They are never critical of the United States. In fact, they are unfailingly respectful and genuinely open as they ask about our political system and about what they perceive to be multiple stereotypes about the Arab world and Muslims. We unravel some of the misunderstandings about our respective cultures. These are smooth flowing, relaxed conversations. It is times like this when I wonder why there is such violence, hatred, and fear in the world. But I cannot dwell there. Each of us can only make peace in our own small ways, wherever we are. Arab Spring is in full gear at this point, and they are constantly paying close attention to the news on their smart phones and other sources. 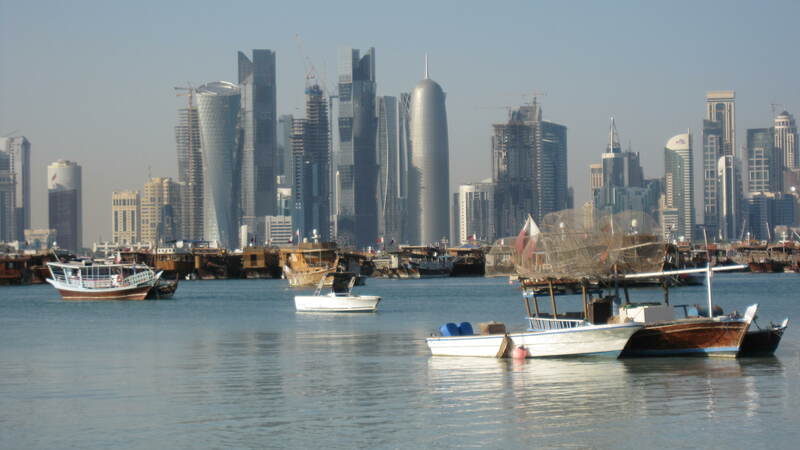 Although there is essentially no unrest in Qatar, where the citizens are comfortable financially, united in their faith, and proud of their rapidly developing country, they are aware of the implications of these revolutions. Hani has been reading as much as he can about post-tsunami Japan. He is fascinated by how the country has handled the devastation. Especially how there has been no looting whatsoever. He shares with us a news story where a reporter tried to make it easy for some Japanese to steal his obviously full wallet. No one did. Dozens of people looked at it and left it alone. One finally turned it in to a train station attendant. We are all uplifted by this. On the day before I leave, they ask my opinion about Muslims having more than one wife. I respond by asking them questions, so I can better understand their take on this volatile subject. I will elaborate on this in a future post about women in the Middle East. We end this conversation laughing and laughing as Shihad expounds on the absurdly high costs of modern weddings in Qatar. “This has become a competition among our families now. Ridiculous! Extravagant! What has happened to the old simple ceremonies?” Does this sound familiar? So here I am with my remaining seven students. Abbas, father of a four-year-old boy and twins – boy and girl- aged two. He is serious, hard working, and earnest, often asking the questions that fuel further learning for the entire group. Siraj has two boys and a little girl, whom he calls “his heart”. Siraj is a charmer, our class comedian, with an open and endearing manner. Very witty, ambitious, quite anxious about his skills in English and his prospects academically. He calls me “Teacher”, and I call him “Student”, in an on-going playful banter. Quiet, mysterious and dignified Naseem is the only unmarried one in the group. He has very little confidence in his ability in English and tends to miss class often. His deep, expressive eyes speak volumes. I get the feeling he is overwhelmed with his life in general these days. Basim has an easy smile and a sweet disposition. He has two young sons. A first he stays virtually silent, as if he cannot believe he will ever be able to utter a word of English- much less read and write it- but as the weeks move along, he speaks out more and more, and smiles more and more. The most confident student in the class is Abdul, who puts in many hours revising his essays and taking practice tests in both reading and listening comprehension. At first, he politely rebuffs me, as if he needs no teacher. He is proud and intense, the father of two daughters. As the class proceeds, he relaxes, participates more, and begins to ask for help. This pleases me because his contributions to our class conversations are helpful. Hani is the cool dude in the group. Another charmer. On a couple occasions, he arrives in class in jeans or some neat, casual outfit, which always throws me, as I am accustomed to seeing him clothed in Arab attire. He is very smart, a quick study, deceptively so. One of those students who appears to be distracted, then excels on an assessment. Hani is warm, kind, clearly a leader, and totally devoted to his three young children, sometimes showing me their photos on his iphone. And, finally, there is Shihad, the oldest of the group at 37. Indeed he seems like “an elder” to me as well, with his direct, intelligent gaze and his no nonsense, mature approach to all assignments. The others respect him and look up to him as a sort of spokesman for the group, and so do I.
Isn’t that the little rhyme that goes with Pin The Tail On The Donkey, played at children’s birthday parties? When players take turns being blindfolded and spun around, then released, in a dizzy whirl, to find the donkey? This is a perfect metaphor for getting places in Dubai and Doha. It does feel like a game. In Qatar, I actually got my own driver’s license and joined the throng of cars. 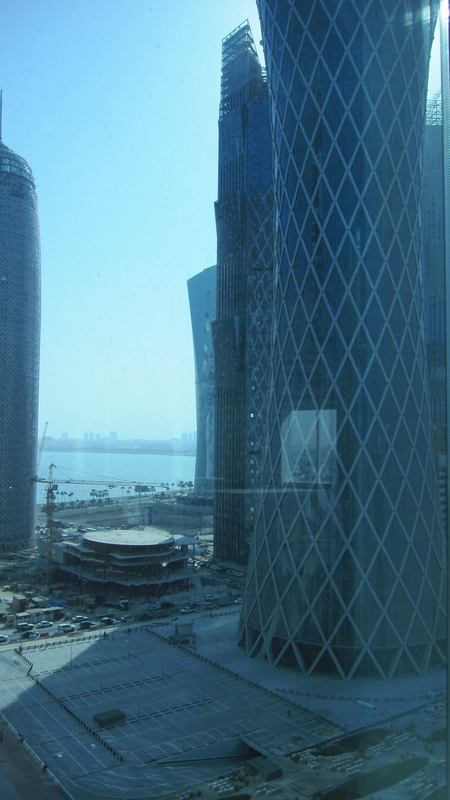 Here is the traffic picture in Doha. Main thoroughfares called C Ring and D Ring – except they are straight, not circles. Roads named after members of the royal family, becoming extensions of each other, that disappear into nowhere (i.e. the desert). Slip roads, marginal lanes, underpasses, overpasses. And- most important- the ROUNDABOUTS, that have colloquial names not marked anywhere on them or on most maps, so references to them as landmarks are not helpful at all for at least the first few weeks of driving yourself places. Then there are drivers who zing from the inner to the outer of the three to four lanes inside roundabouts to exit, with no warning, seeming unconcerned about cutting you off. 360-degree vision is essential. And nerves of steel. I possess neither. 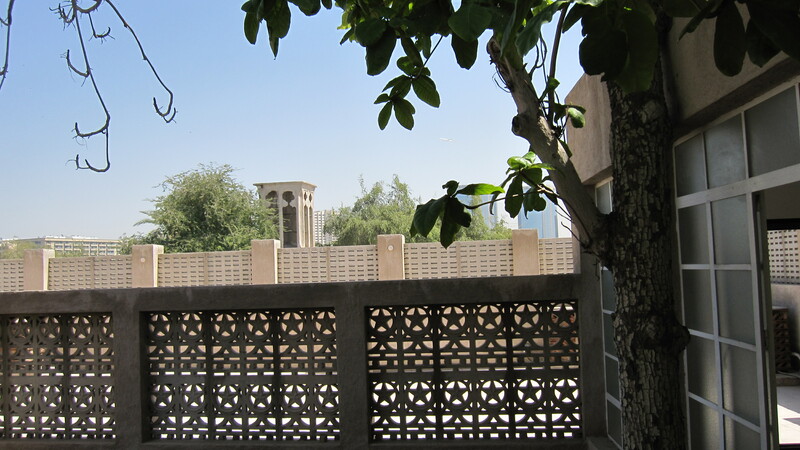 Here are some directions to friends’ homes, with addresses like Palm Beach Residences, Falcon Street and Al Jazi Gardens, Al Dafna, Gate 6, Villa 32, as they were told me verbatim, written in my journal. Mission accomplished. The fresh produce was delicious! 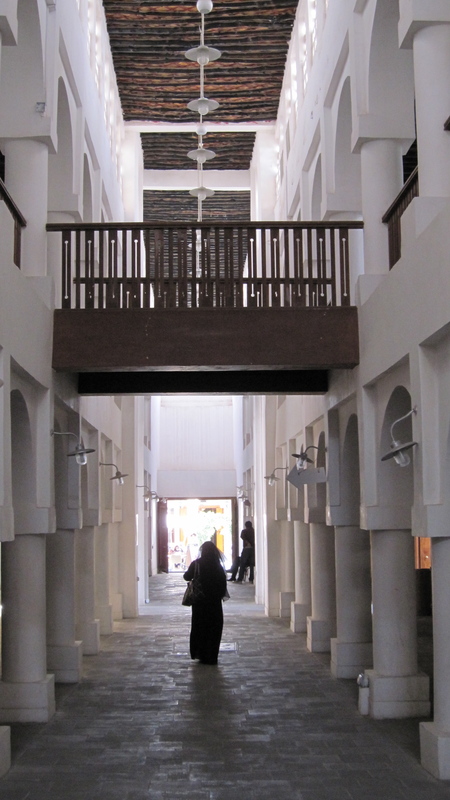 The Past: For centuries, the dwellings of Gulf Arabs were virtually non-existent. Home for Bedouins was where they slept that night, either under the stars or in simple tents of woven goat hair blankets. Royal families lived in more elaborate tent structures consisting of several “rooms” divided by drapes, made comfortable with thick carpeting and cushions. 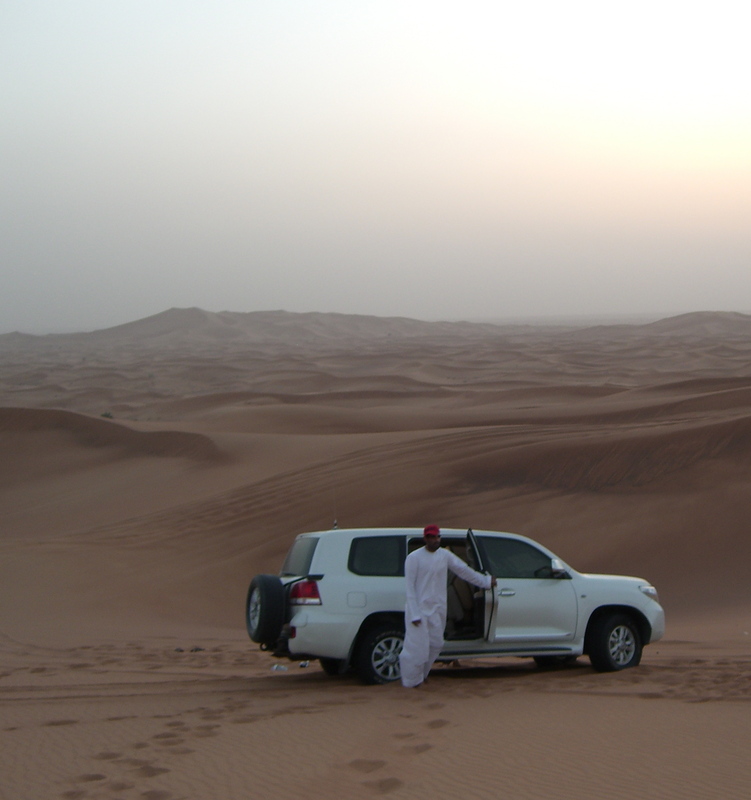 Modern desert camps for tourists resemble those traditional compounds. 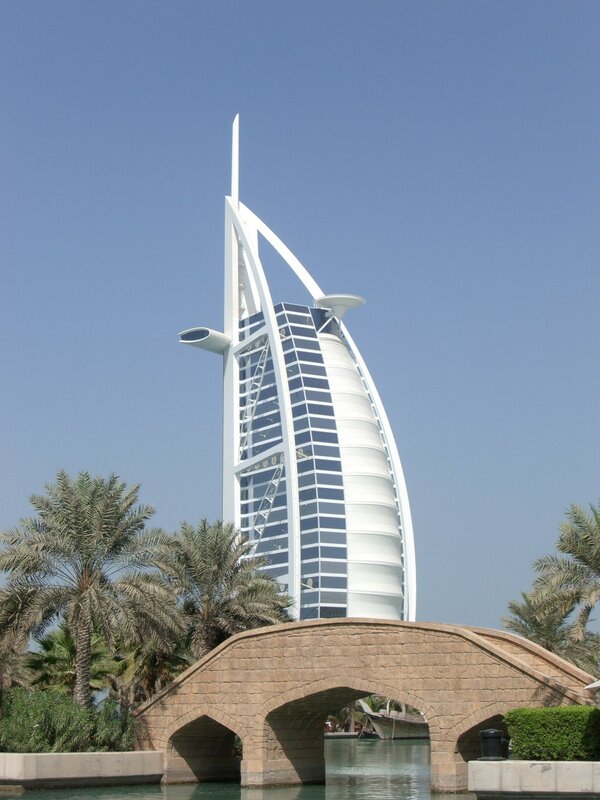 The first distinctive architecture in Dubai appeared relatively recently, in the late 19th century. 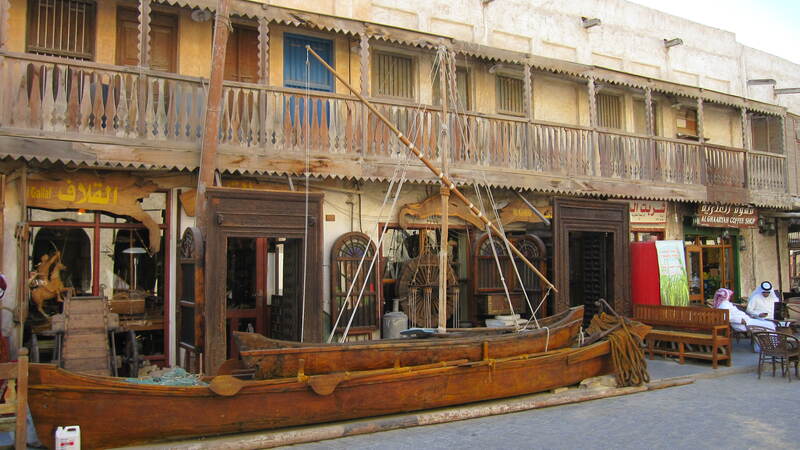 It was imported by merchants from a town in southern Persia called Basta, who were re-settling in the tiny fishing, pearl diving, and trading village of Dubai on the creek opening into the Persian (now Arabian) Gulf. That creek is still simply called The Creek by the locals. 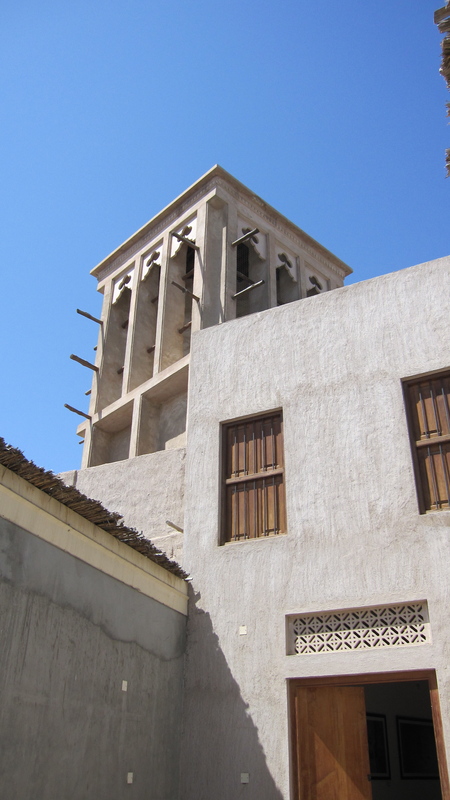 The Persian immigrants built handsome homes with windtowers and courtyards, designed to adapt to the harsh desert climate. Green, sustainable architecture, before those terms were even used. I have never seen anything like them. They are stunning. 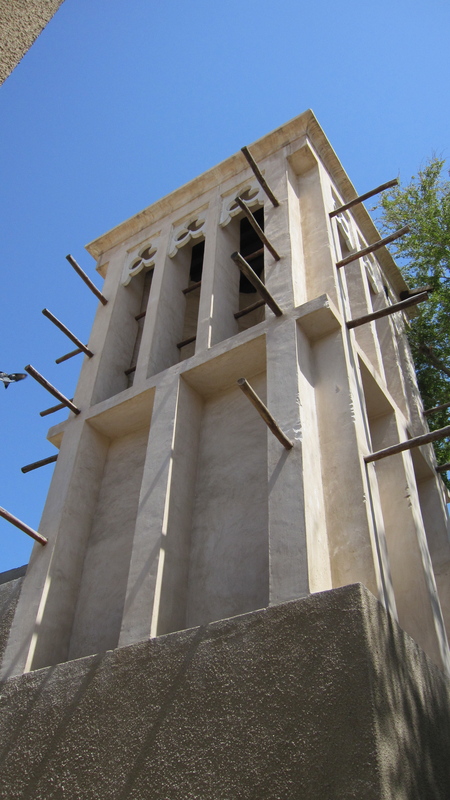 The windtowers are designed to capture the breezes from The Creek and the sea, funneling the air down to the rooms below. The houses and towers are made of petrified coral blocks dug from The Creek and bonded with sarooj- a mixture of clay, manure, and water. Ceilings and roofs are constructed around hardwood beams finished with a mixture of straw and silt. Since it rarely rains, the roofs are flat, providing another gathering and sleeping area for residents, depending on the season. They serve as exterior rooms, designed to maximize exposure to winds for cooling, as they are surrounded by perforated parapets. When it does rain, the run-off spills through spouts and can be collected for other purposes, such as washing clothes or watering plants. The elegant functional form of the windtowers is beautiful in itself. The Arabs, however, with their love of elaborate mosaics and decorative patterns, have added geometric and floral designs wherever they can. 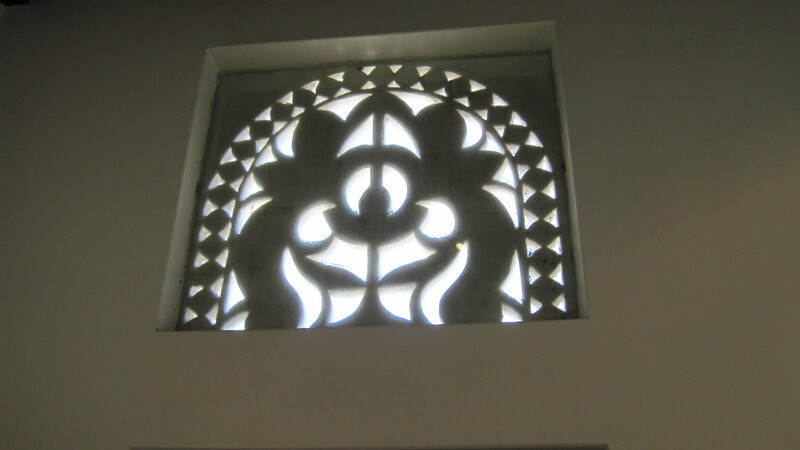 Thus, there are finely carved ventilation screens, arches and balcony balustrades made from limestone slabs covered with chalk and water paste. Intricately carved wooden doors, with fanlight panels over them to diffuse the light and increase airflow, enhance the artistic effect. 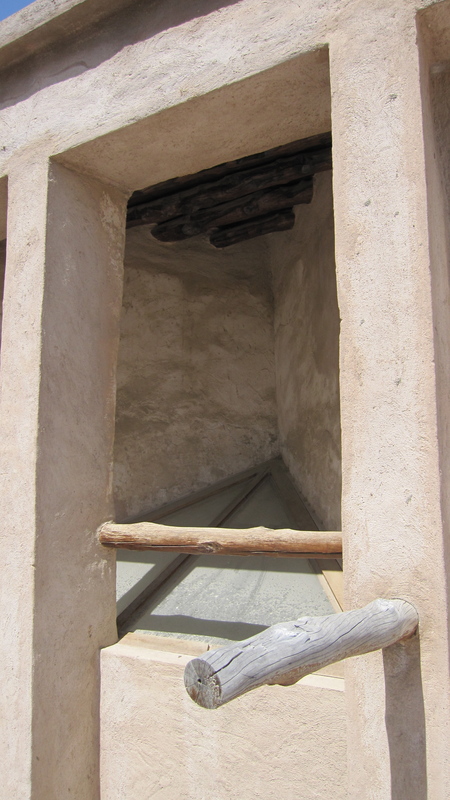 An intriguing side note: the stone balconies on traditional homes in the Middle East, with Arabesque motifs cut into them, are meant to both let in air AND to conceal the women sitting on them. 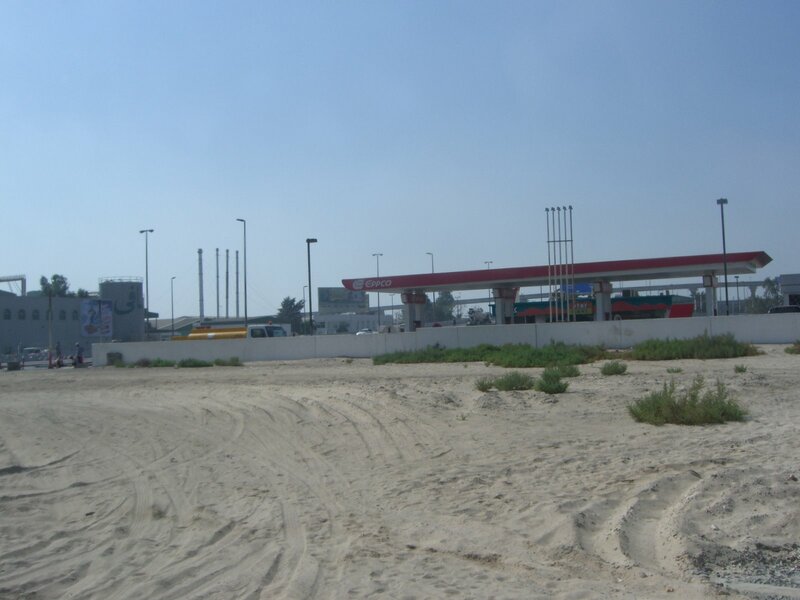 The Present: My previous posts have alluded to the impressive energy and imagination fueling the emergence of Dubai and Qatar as cosmopolitan international centers. Nowhere is that spirit more evident than in the bold, innovative architecture in these cities. The pictures below tell the story. These gleaming steel and glass buildings, in such extraordinary shapes, make a striking contrast to the limestone, coral and mud structures of olden days. When known, the architect’s name is in the caption on the photograph, which you can read by moving your cursor over the image. 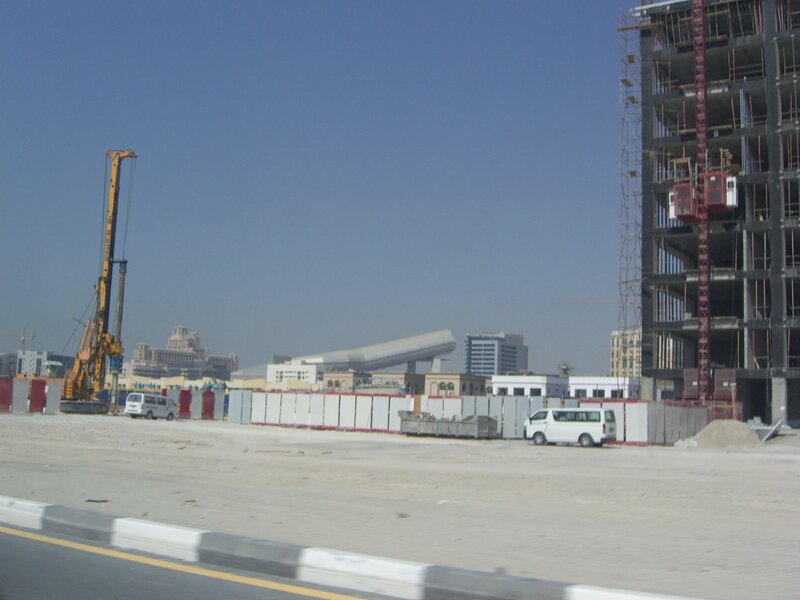 The Future: In December 2010 Doha was awarded the World Cup for 2022. Most people on the planet are skeptical that they will be able to pull this off, this miniscule dot of a country, with summer temperatures of over 125 degrees Fahrenheit! Well, here are just a few of their plans, already underway: lodging for tourists on floating hotels off the Pearl Island; free public transportation throughout the city on a “People Mover”; covered stadiums made comfortable by vast cooling systems and remote control clouds (stadiums which they will then fold up and donate to Third World countries). One of the first challenges in arriving in the Middle East is trying to decode and pronounce the long names. It seems rude and lazy to mumble them or to avoid saying them altogether, and worse yet to call people by the wrong names. When I first started teaching, I was so daunted by the fifteen seemingly identical men in white gowns (thobes) and headscarves in my class with their complicated names, that I wrote notes to myself about their appearance and my own version of a pronunciation system, so I could sort them out. Saleh: “SAY-luh, with the sharp wit and expressive face”. Jalal: “Juh-LAL- easy-going manner and smiling eyes”. Ahmad: “AH (with a little coughing sound)-med, who asks many questions”. Fortunately, one only needs to call them by their first names! I soon learned that there is indeed a pattern to Arabic names. 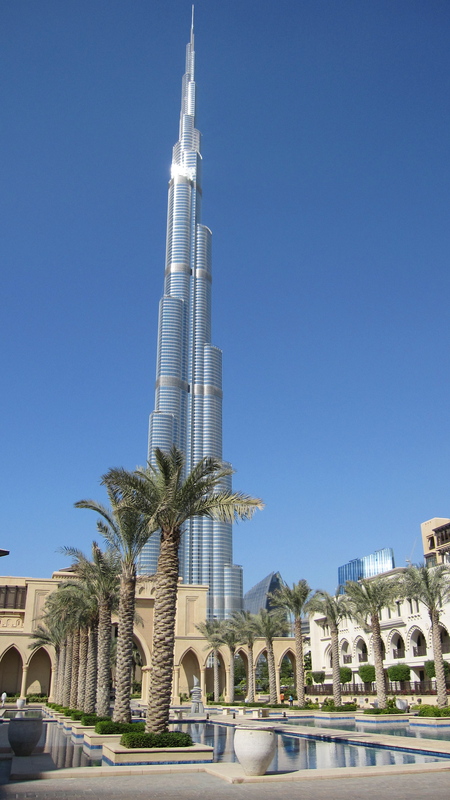 For men, “bin” ( or “ibn”) following the first name means “son of” and is followed by the father’s first name, which is then followed by “al” which means “from the family of.” For example, the sheikh of Dubai is Mohammed bin Rashid al Maktoum. 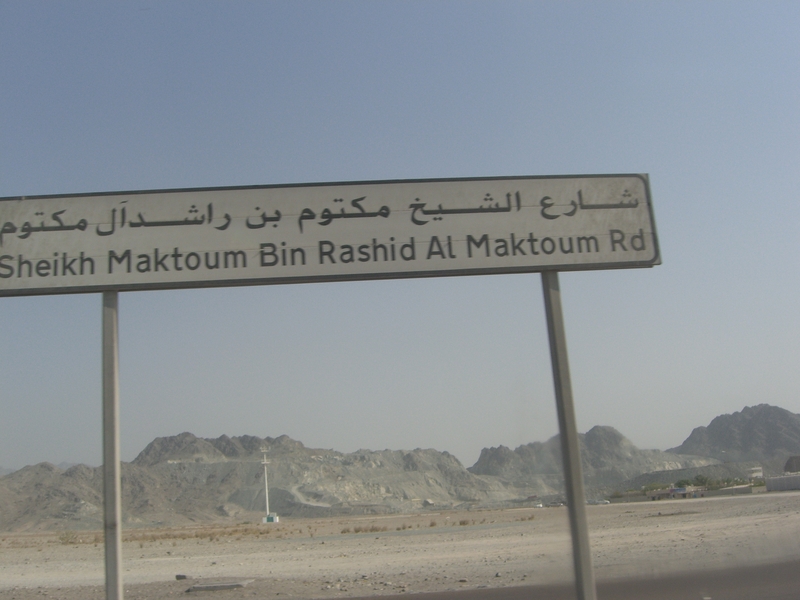 His father was Rashid bin Saeed al Maktoum. 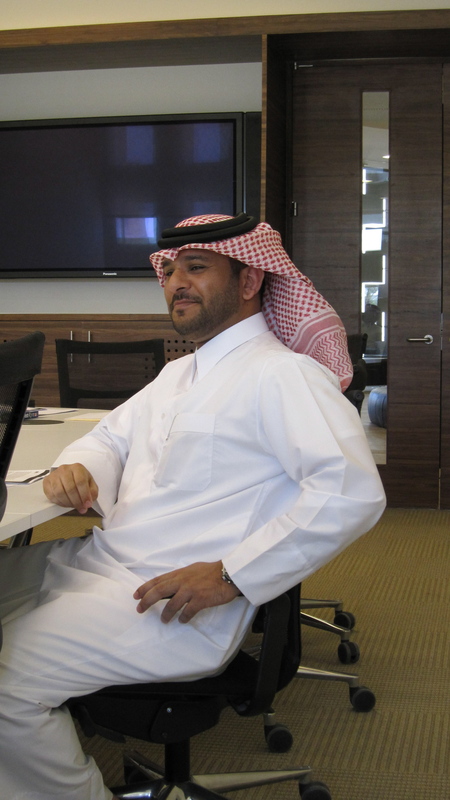 One of Sheikh Mohammed’s sons is Hamad bin Mohammed al Maktoum. 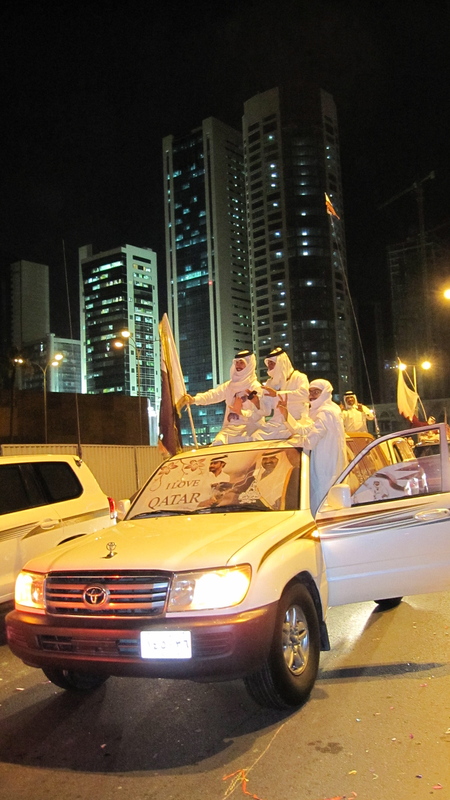 The Qatar “emir,” another term for sheikh used more frequently among Qataris, is Hamad bin Khalifa al Thani. His father was Kahlaifa bin Hamad al Thani. 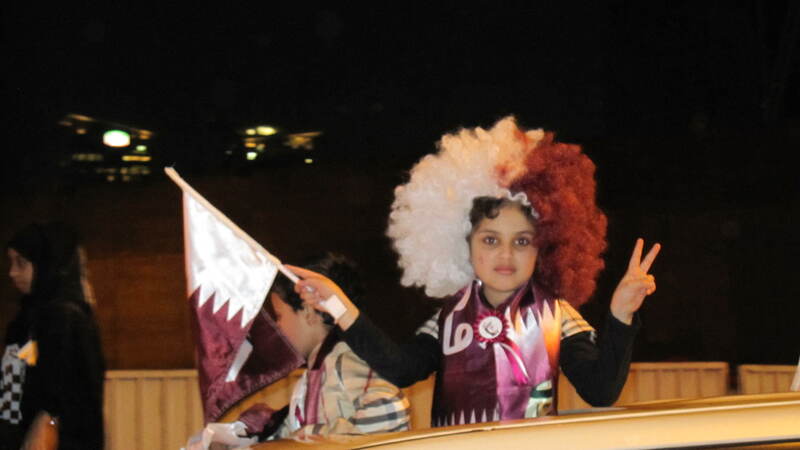 One son of the Emir is Tamin bin Hamad al Thani. There are only a few Arab names. Mohammeds, Khalifas, Thanis, Hamads, Abdullahs, and Hassams abound. Therefore, this naming system allows one to unravel the puzzle of a person’s lineage. And family is absolutely central in the Arab culture, the key to a person’s identity, the most important of all qualifiers. It is interesting to note that women keep their father’s family names when they marry. After a woman’s first name is “bint” followed by her father’s first name, then “al” referring to the father’s family name. For example, the third wife of Sheikh Mohammed is Haya bint Hussein. (She is the daughter of the late King Hussein of Jordan.) The second wife of the Emir of Qatar is Mozah bint Nasser al Missned. This custom means that a couple never has the same family/last name, unless they are cousins, a common arrangement in royal families, which makes things even more confusing! A child never takes on his mother’s family name. In fact, it is impossible to determine who the mother of any individual is in the Arab world unless you are a personal acquaintance or it is a famous, usually royal, family who has made its records public, which is rare. Thus, you will not be able to identify the mother of any individual. At first, I found this strange, but I quickly realized I was over-simplifying, tangled up in cultural nuances and assumption. Many women in the United States keep their so-called maiden names and give their children either hyphenated last names or only their husbands’ names. In other words, they are joining what is called the patrilineal genealogical structure of Asia and the Middle East, where there are no recorded birth lines to the mother’s family. It is easy to get trapped into dualistic thinking. “They do it that way in the East. We do it this way in the West.” The lines are blurred. And there is no one right way. 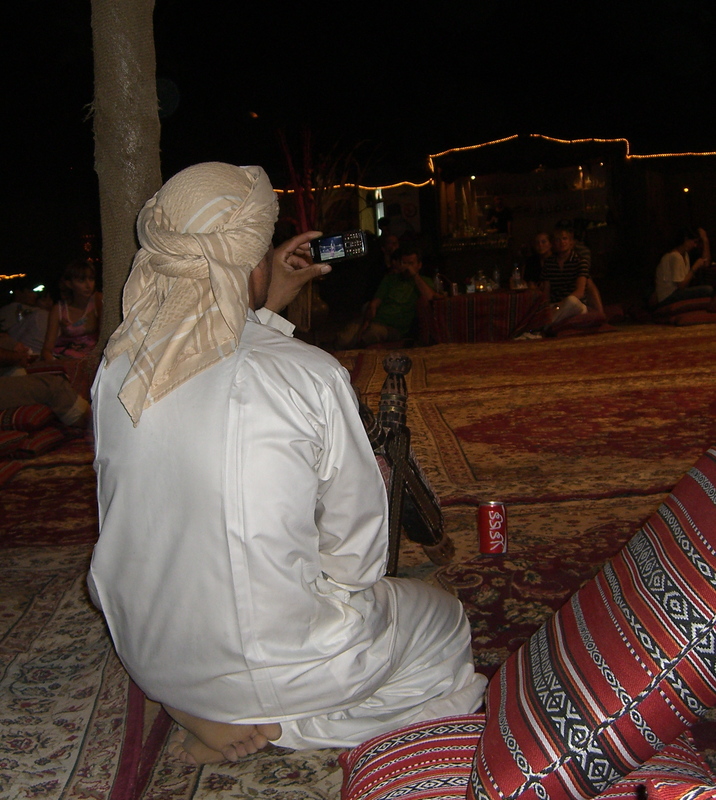 1.Do you, as an expat, have to cover your head? -No. In Dubai, Qatar, Oman, Jordan, and all other Muslim countries EXCEPT Saudi Arabia, the only place it is required for all women, regardless of their faith, to cover their heads is inside mosques. Non-Muslim women can wear their normal attire everywhere else, but it is appropriate to dress modestly. 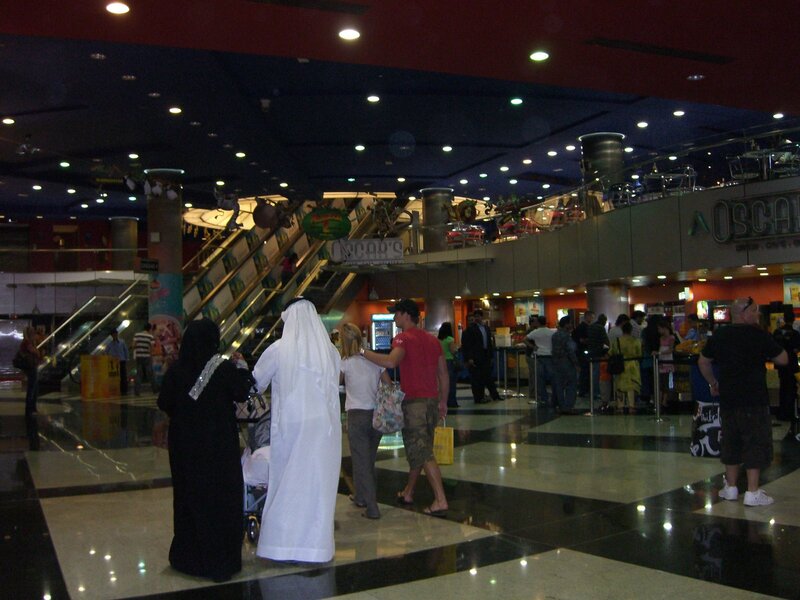 2.Can a foreign woman in Dubai and Qatar go anywhere alone?-Yes. 3. 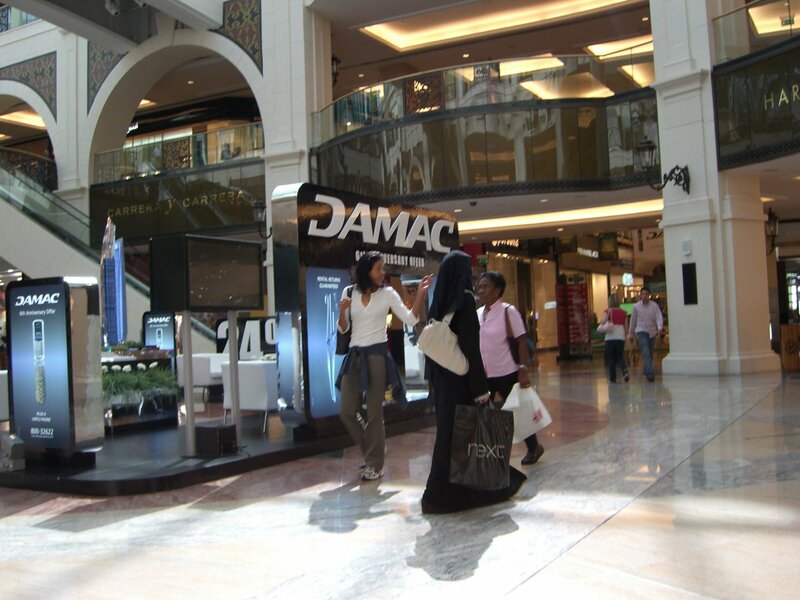 Can a Muslim woman in Dubai and Qatar go anywhere alone?-Yes, I frequently see Emirati and Qatari women shopping and driving alone or with their children. They are, however, more likely to dine out with small groups of women or their families rather than alone. 4. Is it expensive? Yes and No. Real estate is expensive. Prices for food, clothing, and other amenities are comparable to what I am accustomed to paying at home. The cost of services, such as home cleaning, taxis, childcare, salon care, etc. 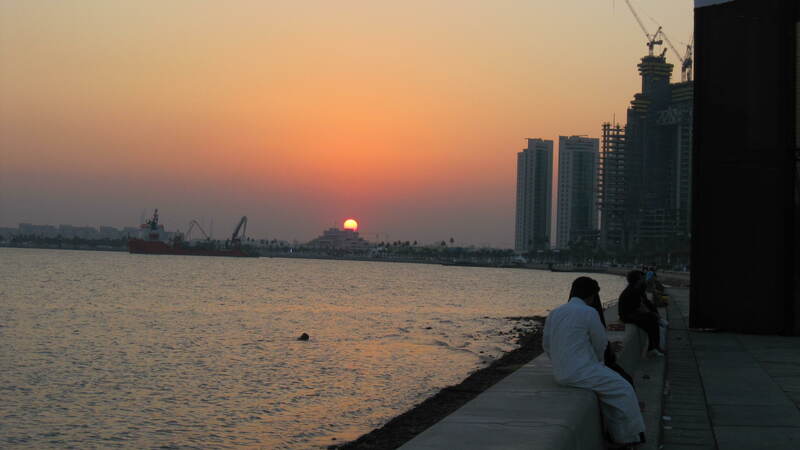 are quite inexpensive, which is what gives the life of the expat the image of ease and luxury. People can afford domestic help, including chauffeurs, here, which would be unthinkable back in the United States. And, of course, the price of gasoline is cheap: 45 cents per gallon! 5. Are you ever afraid for your safety there? –No. 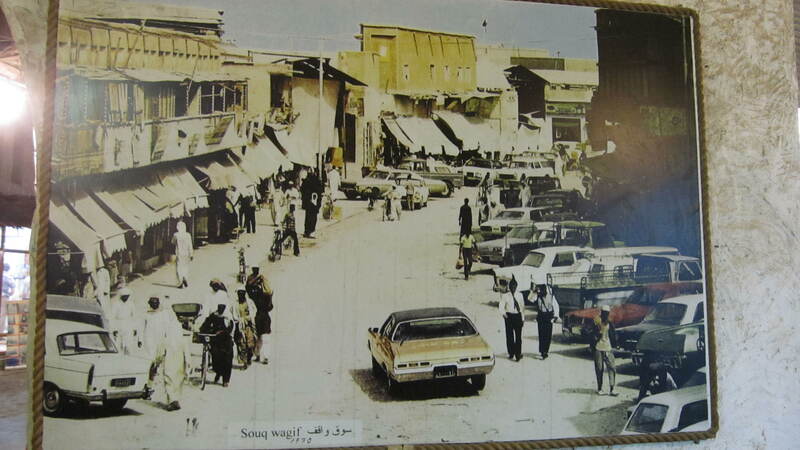 Due to the more progressive attitudes toward women in this part of the Arab Gulf, the family-oriented, slower-moving culture, a large security presence, and the no-tolerance policy on crime, which is strictly enforced, I am never uneasy in terms of my physical safety. It is much more dangerous in US, UK, and European cities! 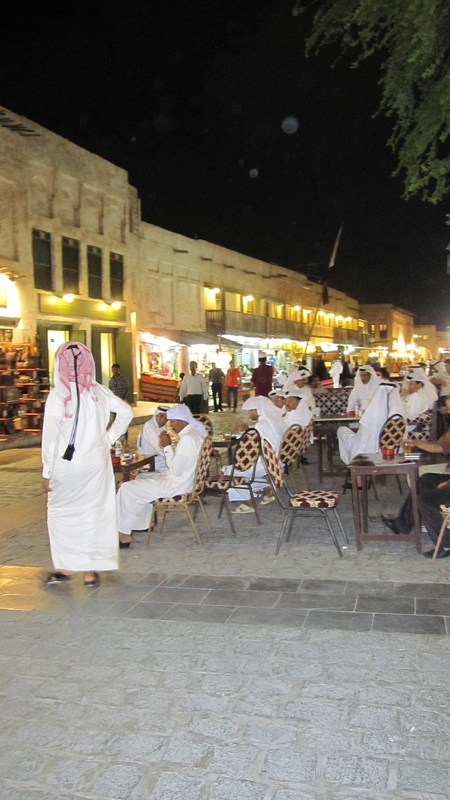 What surprises most visitors to Dubai and Qatar is how clean and civilized these cities are. Some would say sterile. A friend who visited us in Doha repeatedly commented on how “gentle” and cordial the people are, both the women and the men. There are exceptions, of course, but the general impression holds. Certainly there is an understory, however. The no-tolerance toward crime mentality has a dark side to it, for sure. And the English language newspapers undoubtedly cover up a lot of what goes on. Nevertheless, it is ironic that in a part of the world associated with terrorism and violence, we feel safe. These questions reflect the stereotypes that Americans have about the Arab world in general. It seems that many people think that all Muslim countries are like Saudi Arabia, which receives much media attention. Before I lived here, I thought the same! On October 13, on an Emirates Airline flight from Doha, Qatar, to Dubai, UAE, I read the following statement in The Khaleej Times, one of Dubai’s local English language newspapers. It was in an article about an international literature festival: “Iceland is a nation which has always focused on story telling. We think something has not happened as long as it hasn’t been written down on paper.” That describes the way I have felt for many years. Most of my life, in fact. Compelled to record and chronicle. I have kept journals- or notebooks, as I now think of them-for as long as I can remember. Just for my own pleasure and to make sense of my life. The writer Joan Didion has commented that she writes in order to understand what she thinks. I like that! Her explanation resonates with me. Then, on that same flight, I read a remark made by Flannery O’Connor: “You may write for the joy of it, but the act of writing is not complete in itself. It has to end in its audience.” True. And this was the final nudge I needed to begin writing a blog. For the past few years, in Dubai and in Qatar, and now in China and Mongolia, I have been filling notebooks with observations and musings. Living abroad is like attending a fast-paced graduate school in a variety of subjects simultaneously. The experience is stimulating, unnerving and enriching. My notebooks have served as my center, my compass, the place where I go to unwind and digest. In all this traveling, making new nests in new worlds, becoming a part of foreign communities, however fleeting, I have struggled to figure out my role in all of it. Who am I, other than a privileged tourist, a “trailing spouse”? How can I be productive and contribute something worthwhile? Recently, I realized that the answer is actually quite simple. My role is to tell my story and to be an ambassador of sorts, sharing what intrigues and inspires me, from daily interactions to the broader cultural context. 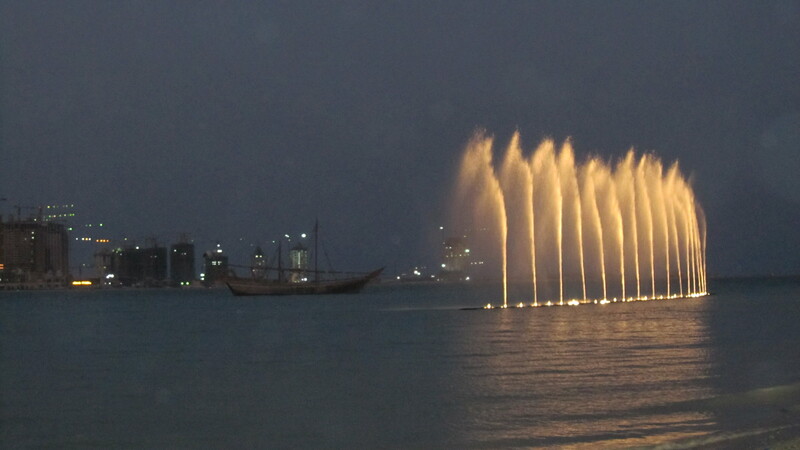 I chose sections of a poem by the Sufi mystic poet Hafiz and a slide show of a whirling dervish performing in the desert outside Dubai to launch this blog. They beckon us to let go, to lose balance, to stretch our identities and our world views. A spirit of play and adventure permeates both art forms. The poet and the dancer are inviting us to enlarge our circles. I hope you will join me!